WRITING I write: non-fiction, essays, monograph, criticism, memoir and history. I have been a featured blogger for the online version of Capper’s Farmer since 2012. I have also written for Grit magazine and Mother Earth News. My style is spare and direct. If I don’t have personal experience with the topic I’m writing about I research first and then write. I write fast and work through my edits quickly because I have an intuitive sense of what sounds right. My work has readability and accessibility. I write from the hip and the heart! ARTIST: I come from a family of artists. It’s in my blood. I earned a Bachelor of Fine Arts from the University of Iowa in 1973 where I studied with world renowned Mauricio Lasanky and Virginia Myers. I majored in intaglio printmaking and drawing and was recipient of the Graham Miller Scholarship. From there I began a long career in graphic design and traveled up the ranks to become Art Director at a Bay Area magazine. For the last 3 years I have taught art to elementary age children in the Madera Unified School District. I am also an experienced drawing and painting teacher for adults. I work in and teach graphite, watercolor, pastel and acrylic. I am honored to have received awards for my artwork including Best of Show, First Place and Honorable Mentions. 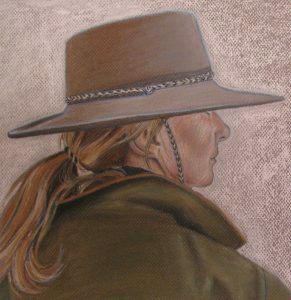 In the last 6 years I have exhibited at the Madera County Arts Council Circle Gallery, Orland Art Center, Red Bluff Bull and Gelding Annual Western Art Show and Chico Art Center in juried shows.